TAO GROUP BLOG TAO NIGHTCLUB LAVO NIGHTCLUB TAO BEACH LAS VEGAS: CHRISTINA AGUILERA AND NICOLE RICHIE RING IN THE NEW YEAR! CHRISTINA AGUILERA AND NICOLE RICHIE RING IN THE NEW YEAR! Christina Aguilera and Nicole Richie helped Las Vegas ring in 2010 at TAO and LAVO at the Venetian and Palazzo Hotels. Aguilera arrived at the red carpet looking stunning in a Moschino dress with jewels by Stephen Webster and chatted about how excited she is for the New Year with her album dropping in March and her movie Burlesque premiering in November. Aguilera, who was joined by husband Jordan Bratman, her sister Rachel and all of her dancers, raved about the gorgeous penthouse suite at The Venetian where they were staying, “'The Venetian is amazing and we've had an awesome time,” she shared. The group dined in TAO’s private dining room before heading upstairs to a sky box in the nightclub. The pop star was so excited to lead the packed club in the countdown to 2010 that she took to the stage a few minutes early much to delight of the crowd. After pronouncing "Happy New Year" she left the stage and gave her husband a special kiss before heading back to the skybox to enjoy the rest of the evening. 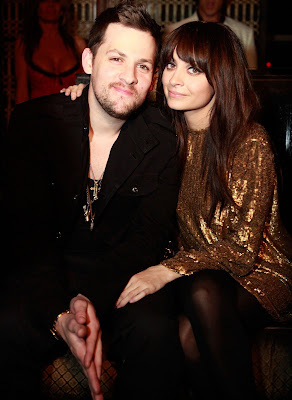 At LAVO Nicole Richie and beau Joel Madden were on hand to celebrate with revelers at The Palazzo. Richie, who has a jewelry collection and is launching clothing and shoe lines, wore a gold low backed dress of her own design – a custom piece from her collection Winter Kate. The mother of two and burgeoning poker fan was excited to come to Vegas, but the couple didn’t want to be away from their kids for too long so they made the trip very quick. They flew in on Thursday and spent the day in the luxurious Sienna suite at The Palazzo, enjoying cupcakes from Sweet Surrender as well as an Italian feast in the private dining room at LAVO. As for New Year's Resolutions Nicole aims to be the best version of herself and "grow gracefully." Richie took to the catwalk at LAVO two minutes before midnight and turned her own camera on the crowd, snapping shots to post on Twitter. 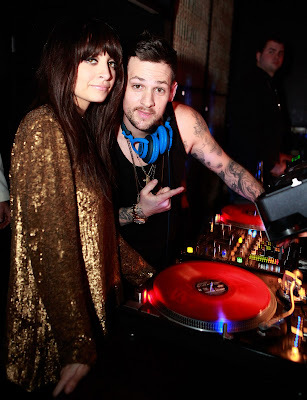 After counting down the last seconds of 2009 she joined Madden in the DJ booth as he spun a special set for the packed nightclub. Actor Ryan Gosling, who was spotted chatting with Jaime Murray from the Showtime hit Dexter, a very single Sum 41 rocker Deryck Whibley, model Devon Aoki and Wilmer Valderrama of That 70’s Show fame and Michael Steger from the CW’s 90210 along his wife Brandee Tucker were all spotted ringing in 2010 at LAVO. Valderrama got on the microphone at LAVO, entertaining the crowd while doing shots of Patron, while Gosling, Murray, Whibley and Aoki all headed to TAO after 2 am to finish their New Year’s celebration.